Welcome to the website of the European Paediatric Association, the Union of National European Paediatric Societies and Associations (EPA/UNEPSA). 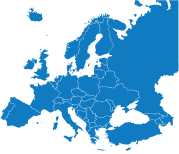 The European Paediatric Association (EPA) is a pan-European scientific association which is the Union of National European Paediatric Societies and Association (EPA-UNEPSA). 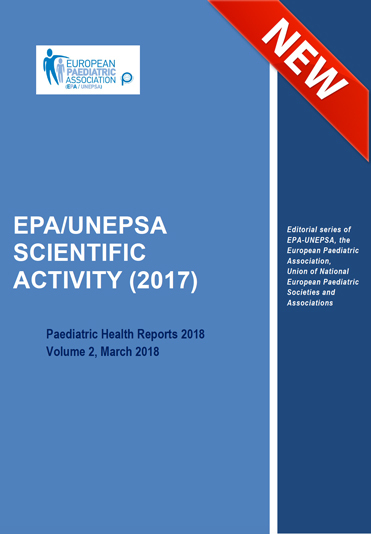 The main objective of EPA-UNEPSA is to encourage scientific co-operation between not-for-profit National European Paediatric Societies/Associations and between European paediatricians working in primary, secondary and tertiary paediatric care in Europe, in order to promote child health and comprehensive paediatric care. Founded 35 years ago, it now represents 50 National European Paediatric Societies and Associations and operates on a non-profit basis. Its General Assembly is made by the Presidents of the major national pediatric societies active in the Nations of geographic Europe, and currently represents more than three-quarters of all European countries, working closely with the major international organizations, including WHO, UN, EMA and the Council of Europe. Since its foundation in 1976 in the St Sophia Children’s Hospital in Rotterdam, Holland, in its role as prominent European paediatric organization, EPA-UNEPSA has typically encouraged education of patients, families and care givers by translating specialistic knowledge to generalists, and worked to improve the quality of paediatric patient care in all European countries including both member and non-member states of the European Union, by adequate clinical research and by implementing research into practice. A fundamental part of EPA-UNEPSA role as a pan European association of 50 member societies is to understand and embrace diversity, and to foster the exchange of experiences and cooperation amongst paediatricians in Europe, enabling the members of the national European pediatric societies and associations to exchange experiences and share best practices, in the spirit of “learning across borders and languages”. EPA-UNEPSA website has been inspired by the leading concept of “working and learning together”, with the intent of enabling European paediatricians to access useful scientific information, exchange experiences and share best practices. Our aim is to encourage cooperation amongst paediatricians in Europe and create a learning hub for the paediatric community, also providing a useful platform for the development of proper paediatric e-learning projects. Wellcome to the EPA-UNEPSA website! 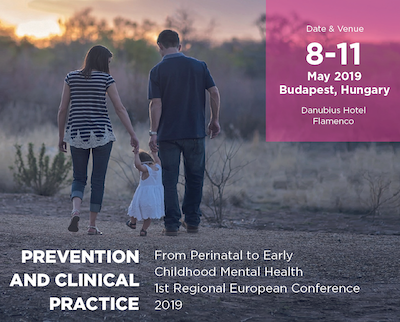 Professor David Branski was the former Secretary General of the European Paediatric Association, the Union of National European Paediatric Societies and Associations (EPA-UNEPSA) from 2002-2009 and former Director of the Pediatric Division at Hadassah, Israel. 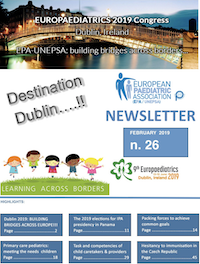 Issue 18 of the EPA/UNEPSA newsletter is now online and features highlights from the successful 6th Europaediatrics Congress, as well as updates from the General Assembly which was held in Glasgow during the conference. EPA/UNEPSA, The Hungarian Pediatric Association and the University of Debrecen are deeply aware and announce Prof. Éva Oláh, former Vice President of EPA-Unepsa and Representative in IPA, former Director of the Pediatric Department, Founder of the Clinical Genetic Center, holder of many awards and honors at the age of 76, she left us forever, on April 2, 2019. We keep our memory with grace and love.